1st segment: Scot said according to the Gospel of Matthew, Jesus will judge us on the basis of whether or not we fed him when he was hungry, gave him drink when he was thirsty, welcomed him when he was a stranger, clothed him when he was naked, and visited him when he was sick or in prison. What we have done for others, he will tell us, we have done for him. The Catholic Church has traditionally called these six acts of kindness-along with a seventh, burying the dead — the “Corporal Works of Mercy.” In this down-to-earth yet inspiring guide, Father Andrew Apostoli, explains the Corporal Works of Mercy and illustrates multiple ways we can do them in our modern everyday life. Father Apostoli also outlines the lesser-known but equally important “Spiritual Works of Mercy”: counseling the doubtful, teaching the ignorant, admonishing the sinner, consoling the afflicted, forgiving offenses, bearing wrongs patiently, and praying for the living and the dead. And he offers many creative ways these too can be made part of our lives. As a founding member of the Franciscan Friars of the Renewal, Father Apostoli knows firsthand about the challenges and rewards of caring for those in physical or spiritual need. 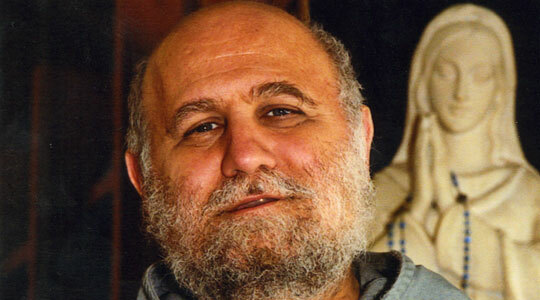 His order is dedicated to the works of mercy, and Father Apostoli brings to this subject a great wealth of spiritual and practical wisdom gained from personal experience. He welcomed Fr. Andrew back to the show. Fr. Andrews said it’s a pleasure to be back and thanked Scot for all he’s doing to broadcast the Gospel. We are challenged by the Holy Father to build the civilization of love in the new evangelization and the challenge in our country. Scot said they had a great conversation l;art summer on his book about Fatima, but this book “What to Do When Jesus is Hungry” is the instruction manual for how to live the Good Catholic Life. But first, Scot asked Fr. Andrew to share about the Franciscan Friars of the Renewal. He said on April 28 they will be celebrating their 25th anniversary. It was a movement of the Holy Spirit. Eight Capuchin Franciscans from the New England province and New Jersey province felt the Spirit leading them to bring deep changes to bring them back to an earlier charism on which the Capuchins were formed. They now have 125 friars in 15 houses, including in Central America, Europe, and across the US. About half the community is in the New York metropolitan area. Fr. Andrew said their main charism comes from the original charism of St. Francis. By his own personal holiness led a deep life of prayer expressed, first, in his preaching. He restored a real deep sense of the apostolic life. From the time of St. Benedict to St. Francis, religious life had become monastic, but St. Francis brought back the idea of going out to preach among the people. Jesus sent out the apostles, telling them to take nothing for the journey, and so sent the friars out to be active in the world. So the CFR evangelize and care for the poor, just like St. Francis. He cared for lepers, he brought peace to society. He brought peace by having the third order seculars in his order promise not to take an oath of fealty and not to carry weapons. Scot asked how the CFR serve the materially poor here in the US, especially in the Bronx and New York area. Fr. Andrew said the friars always choose to go to poor places. There are poor everywhere, including in America. There are those who live on the fringes and are marginalized. He said serving the poor can be for everyone. Many parishes have food pantries, for example. Scot recalled the ministry of My Brother’s Keeper in Easton and the Cor Unum meal center in Lawrence. He asked Fr. Andrew about the genesis of this book. Fr. Andrew said he writes for Envoy magazine and the editor, Patrick Madrid, asked him to write about the works of mercy, what they are, how important they are, and how people can in a practical way live it out. A lot of times a person has a desire and doesn’t know what to do. The Holy Spirit inspires creativity among people and it gives them a chance to express their zeal for the spread of the Gospel. St. James says if you see someone who’s hungry, and wish them well but don’t do anything for their need, then your faith is dead. One of the signs that Christians are living the Gospel is a practical outreach to those in need. Scot said Fr. Andrew quotes Mother Teresa in his book who said that we can’t do anything for God in heaven, so He became a man for us to serve him in the poor, to take care of their needs. These are the people society doesn’t even want around. He noted that as many as 90% of children with Down syndrome are aborted when detected, but everyone who has one of these children says that they are so loving. The roots of all the works of mercy is that as much as we have served the poor, we have served Jesus. In the book, Fr. Andrew says feeding the hungry takes precedence. He said that Jesus himself took a lot of concern about their need to eat. In the Gospel of John, chapter 6, Jesus asked the apostles to take care of the people’s need for food, and the little boy generously gave the fishes and loaves. We can’t feed everybody, but for those we can feed, we can also give them a special kind of love. He remembered Mother Teresa said she didn’t work with government feeding programs is that she had to give the poor what the government couldn’t, the love of Jesus. Scot said we can take for granted the number of people who go to bed hungry, including the in the US. In some places, there can be a lack of supply of food, for instance. In the book, Fr. Andrew said one practical way we can help feed the poor is to give to a food pantry or volunteer at a soup kitchen. He said someone has to provide all that food that is served. He said Fr. Solanus Casey set up a soup kitchen in Detroit to feed all the people that came to see him. People can help cook food or assist in the background, or even spend time with the people. At the Fr. Solanus Soup Kitchen in New York, the Franciscan Sisters of the Renewal pray the rosary with those coming for food. Scot said Fr. Andrew said what the poor and hungry are often seeking the most is companionship to overcome the deep loneliness of homeless or poverty. Fr. Andrew said the friars of his community work at the shelter and they sit and talk with the men and they make you feel like you made their day by talking to them. One of the hardest imprisonments is solitary confinement and many of these people are in a kind of solitary imprisonment. We need to know we are loved and cared for. Another idea is identifying elderly in our neighborhood and do their shopping or take them to the market and spend some time with them. Scot said most of us live near the elderly and perhaps they might need some help. Fr. Andrew said a person may be able to get a few people together in the parish or prayer group and organize an effort to get food for three or four people. They may not have the means to get their food or able to get out or have a car. You don’t have to go to a foreign mission to help someone. He does caution when you do this work, do it joyfully. People you serve could start to call you constantly and become disruptive. You must be ready for this. St. Paul said, Decide how much you can give, and when you give it, give it cheerfully. It’s not just the recipients who benefit, but those who volunteer are also fulfilled as well. Scot said Fr. Paul O’Brien at St. Patrick Parish in Lawrence with the Cor Unum meal center says that they have a crisis of volunteers in the summer months. He said another idea is voluntary fasting where we offer up the savings based on the difference between what we would have spent and actually spent as a donation to a soup ministry. Fr. Andrew said for those who don’t have much money to give, then giving up something in a spirit of sharing can be a service to the poor. The fifth of the corporal works of mercy is visiting the sick. Scot said the sick are also often lonely, especially those in nursing homes and assisted living. Fr. Andrew suggests in the book that we can assist the families of the sick. He said sometimes we may hear of someone who is ill and in need and we can visit them or even just send a card or make a phone call, especially if the person doesn’t have family close by. It can not only be a spiritual benefit to the person, but being less lonely and in better spirits it can help them get better. Fr. Andrew remembers as a boy when his mother broke her leg that a group of Third Order Franciscans came to his house and took care of all the chores she couldn’t do and he was touched by their kindness. It had a profound effect on him. Maybe there’s a way to find the people through the parish who are sick and organize to help. It’s not that we should be pushy, but make a gentle invitation and offer to bring whatever they need. Scot said there are many people who are requesting Communion calls and those same people may also just want someone to come by and sit and talk. Scot said the chapter on visiting the imprisoned was moving. Fr. Andrew talks about a conversion of attitude he experienced. He said we never look down on the imprisoned because great conversions take place there. Maybe in some cases it was God’s divine providence to allow them to spend that time in contemplating their place in the world. He thinks a lot of those conversions last after they get out. In the book he says we can “visit” those in prison by our prayers and by supporting chaplaincies, especially if we can’t go there in person ourselves. He said he cautions people not to give out full names or addresses or contact information to prisoners. That’s why he suggest getting guidance form the prison chaplain. Keeping those cautions in mind, spiritual letter writing can be effective and fruitful. He said he heard that there was an extraordinarily high number of Catholics on death row because of so many conversions to the faith. Many of them turned to the faith because of what the Church offered to them as they faced their mortality. The last of the 7 corporal works of mercy is burying the dead. Scot said we can’t for granted anymore that our kids who may not practice the faith will not make sure we have a Catholic funeral for us. We need to make sure we create mechanisms by which our wishes are carried out and followed through. Fr. Andrew said in the early Church there was an actual ministry of taking care of the dead and providing for their burial. He writes in the book of the importance of the wake to help the grieving deal with their loss. A priest or religious can come to the wake to lead praying the rosary and maybe to give a short talk. This can help people begin to let go of their sorrow and come to grips with it. Even Jesus wept at the death of Lazarus. It can take a few years for someone to let them go and people often need help or at least support to do that. Scot said it gives an opportunity to share how the deceased affected our lives. Many of the stories Scot has shared at wakes came as an inspiring surprise to see how their loved one affected another. Scot asked Fr. Andrew where they come from. Fr. Andrew said they come from the life of the Church. Each one fulfills the life of a Christian. My love for Jesus and my love for my neighbor must find some visible expression. He ties in the works of mercy to building up the civilization of love. These works of mercy also motivate people. If I’m holding on to anger and am unable to get beyond hurt, it can block my love for Jesus. To forgive is a part of the Gospel. Listing it as one of the works of mercy almost serves the same purpose as an examination of conscience. Scot said two of the works sound harsh to modern ears: instructing the ignorant ad admonishing the sinner. The ignorant are just people who don’t know the love Jesus has for them. It’s not a put-down. Fr. Andrew said we’re not calling people names. It’s just people who don’t know the faith as they should. The truth will set you free, but if you don’t know the truth, how can it set you free? Over the past 60 years we have opened up a big gap in knowledge of the truth. We will fill in the knowledge that’s necessary for spiritual growth. Scot said in the chapter, Fr. Andrew tells us that we need to teach the faith to our children. Putting out children into religious education for one hour a week doesn’t work if the parents aren’t the primary teachers of the faith and modeling the faith to them. Fr. Andrew said if that home setting is not there, what they learn in religious education will sound empty and distant because they don’t experience it in their own home. That’s why parents need help in recognizing the truth. We need a good catechesis for the whole Church. Scot encourages everyone to read the book, especially for Lent. Fr. Andrew suggested asking for it at the local Catholic bookstore. Fr. Andrew is often seen on EWTN in various programs and has had several series on the network.